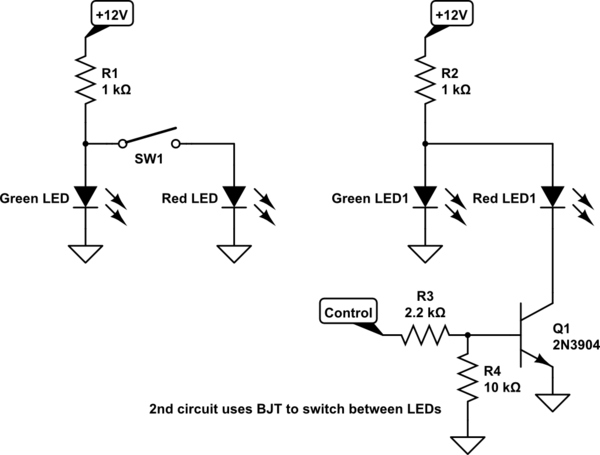 I would like to control the output of two LEDs with a single pushbutton. When the button is open, D2 should be off and D3 should be on; when the button is closed, D2 should be on and D3 should be off. I would like to achieve this effect using only BJTs. However, I'm almost certain that this is not optimal; for example, I have a feeling that a solution can be achieved without requiring D1. Can anyone point me to a better solution? When Q1 is activated Q2 is disabled. When Q1 is deactivated by removing the input from the left of R4, R3 will acquire enough current thru D1 and R1 to turn on Q2 and activate D2. Both LEDs can share the same current limiting resistor too but maybe I might put a resistor across D1 just to leak enough current into the base of Q2. 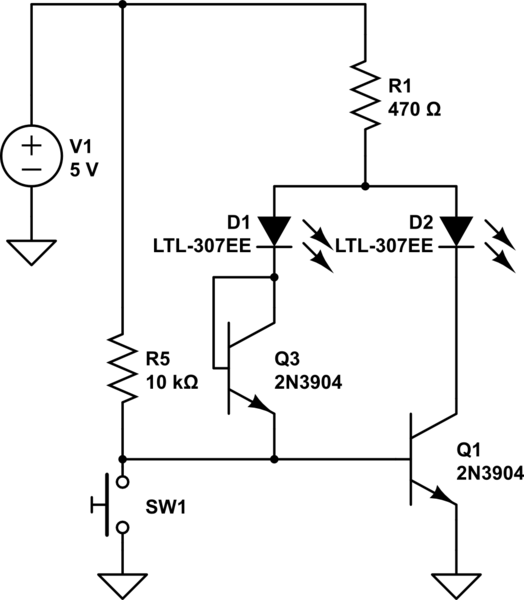 This or use two LED current limiters - the jury is out on this - depends on supply rails to a certain extent. This is just to share my view point. I am not sure whether this will work, just posting it as answer for public scrutiny to improve my understanding. Switch SW1 can be replaced by either a bipolar transistor or MOSFET. 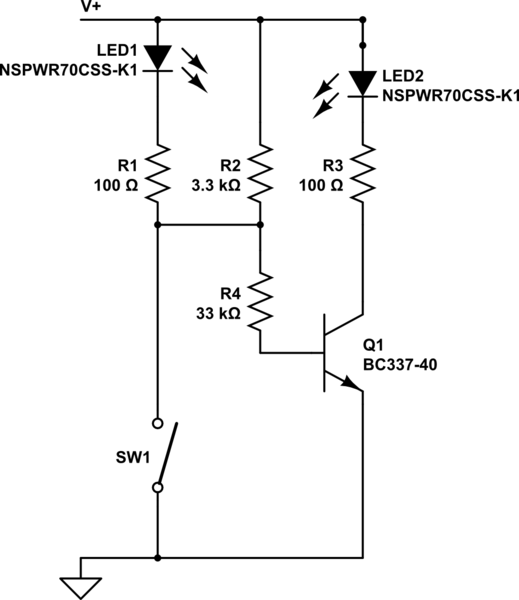 How this works is very simple: A modern Green LED has a forward voltage drop of about 3.2V. 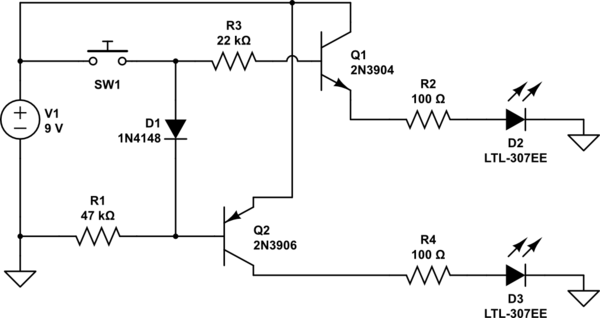 A Red LED has a forward voltage drop of about 1.7V. When the Red LED is connected in parallel with the Green LED, it diverts all of the current to the Red LED and the Green LED goes out. I'll add comment to this in due course if necessary. R2 is optional. What does it do and what happens if it is omitted? Resistor values nominal and may need adjusting. Value of R4 will affect LED drive and also "something else". Ratio of R4:R2 not critical but relevant. LEDs are up to you - ones shown are super marvellous through hole - you'd run them lower than this if using the original Vdd - but only need half the current you'd use with most others. Transistor is my favourite "jellybean" - use what suits. Not the answer you're looking for? 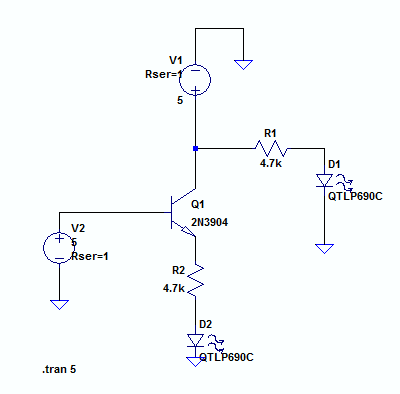 Browse other questions tagged led bjt or ask your own question. 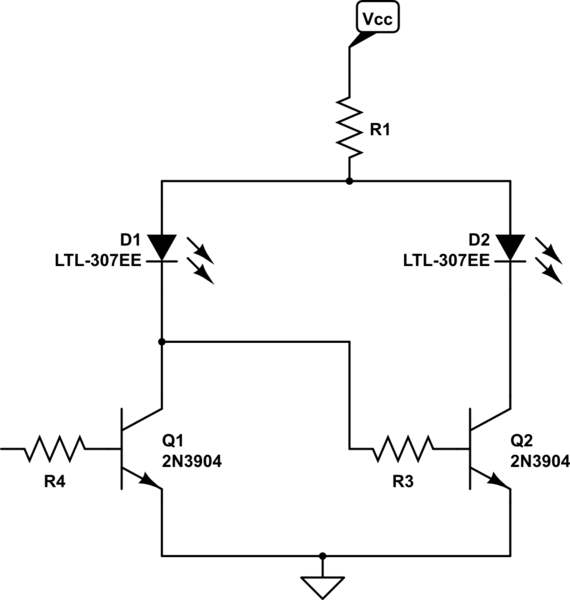 A circuit to fade-in and -out LEDs (DRLs) only when the car engine is running?